Have you been frightened by a dangerous overtaking manoeuvre while cycling? If so you are not alone as these overly close passes on Irish roads show. 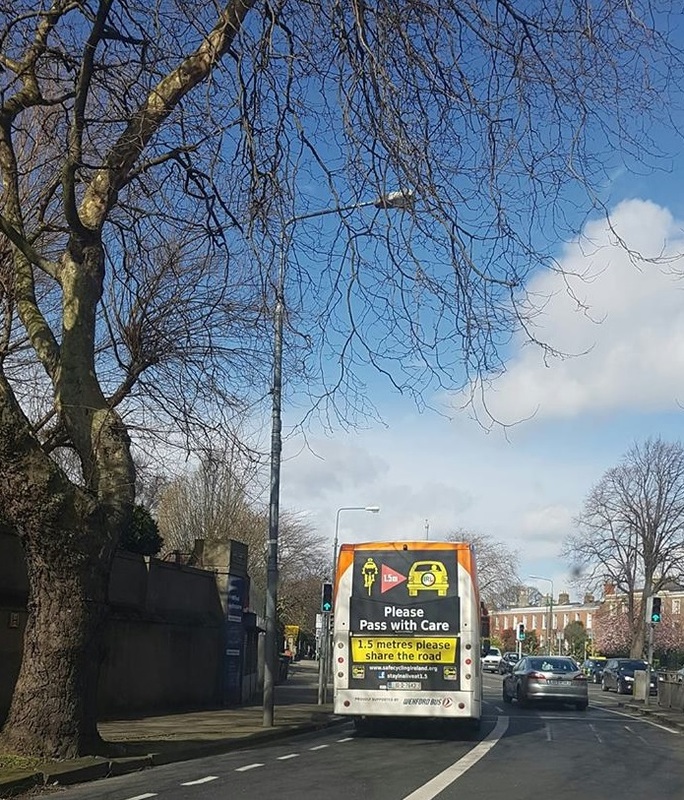 In fact, a recent survey conducted by Stayin’ Alive at 1.5 and the Dublin Cycling campaign revealed that 97.2% of respondents had been scared by a dangerous overtaking manoeuvre whilst cycling. While according to findings from Dr. Rachel Aldred’s Near Miss Project, close passes account for one third of threatening encounters cyclists have with motor vehicles. They present a significant barrier for people new to cycling and those who cycle at a more sedate pace (<8mph). The project found close passes are particularly a problem for women who, on average, cycle more slowly than men and experienced a 50 per cent higher rate of close passes. One proven method of making roads safer for people on bicycles is through the introduction of Minimum Passing Distance Legislation (MPDL). The idea is very simple: drivers of motorised vehicles are required by law to provide a safe space when over-taking a person on a bicycle. The measure has been introduced successfully in many countries and in the states/provinces of other countries***. A Private Member’s Bill (i.e. a proposed piece of legislation introduced by an individual TD or Senator) drafted by Deputy Ciaran Cannon may now proceed to the stage where it is debated in the parliament. The MPDL would mean that drivers must provide at least 1.5 metres of a gap when over-taking people on bicycles when drivers travel above 50km/h; and at least 1.0 metres when they travel below 50km/h. The bill can be read here. We in Dublin Cycling Campaign - and in Cyclist.ie - the Irish Cycling Advocacy Network - strongly support this proposal that has been developed by the Staying Alive at 1.5 group. But we urgently need your help in order for this bill to pass through parliament and to become law. Everyday cycling has become an increasingly scary experience to the point that, as per the most recent Census data (2011), just 6,592 secondary school pupils now cycle to school, whereas in 1986 the figure was 50,648. Over the same period the numbers of primary school pupils cycling to school has dropped to just 6,252 (in 2011) from a figure of 23,635 (in 1986). Parents are no longer willing to see their children cycling on increasingly hostile roads. Close overtaking is an extremely frightening experience for a person on a bicycle - they do not have a metal shield around them protecting them from motor vehicles travelling at speed. A safe overtaking distance means that if a person on a bicycle needs to avoid a pot-hole or wobbles (for whatever reason), then drivers will still avoid them. You might also like to add your own points and refer to local geographical locations in your letter so as to elaborate on why you support the bill. Visit https://www.whoismytd.com/ to see who are your local TDs - it’s super easy. When emailing, provide your home address so they know you are in their constituency and monitoring how much attention (or not!) they give to cycling. Thank you - and do let us know what responses you get from your TDs (you can mail us on info[at]dublincycling.ie). Your Dublin Cycling Campaign and Cyclist.ie team! *** The 28 US states with specific cyclist related minimum passing distance laws (MPDL) are Alabama, Arizona, Arkansas, California, Colorado, Connecticut, Delaware, Florida, Georgia, Illinois, Louisiana, Kansas, Maine, Maryland, Minnesota, Mississippi, Nebraska, Nevada, New Hampshire, Oklahoma, Pennsylvania (4 feet), South Dakota, Tennessee, Utah, Virginia, West Virginia, Wisconsin and Wyoming. Note that Washington DC also has MPDL but is not a state - it’s a federal district. Note also that specified distance passing bills are currently being considered in Massachusetts, Michigan, Ohio and Rhode Island. In Canada, the provinces of Nova Scotia and Ontario have MPDL; in Australia, the provinces of South Australia, Queensland, Australian Capital Territory and New South Wales have MPDL while it is also being considered in Western Australia.